ABAP developers can export graphics from SAP Form Graphics administration SE78 transaction using ABAP report whose source codes are shared in this ABAP tutorial. Unfortunately there is not a single click solution on SE78 SAP transaction screen to export graphics, logos or export images from SAP BDS system. This ABAP tutorial provides an easy program to extract bitmap images from SAP BDS (Business Document Service) and save on a local folder as a bitmap .bmp image file. As well as uploading bitmap images or graphics to SAP images document server, it is sometimes a requirement to download and export images from SAP document server where ABAP developers and SAP customization specialists manage using SE78 tcode. In this SAP tutorial, I will show and demonstrate how you can export images (for this tutorial SAP LOGO BMP). This is a color bitmap image as shown in below SE78 transaction UI screenshot. Let's start out tutorial by creating a new ABAP report using ABAP Workbench. First, we will start by building the selection-screen codes. Here as you see below, the ABAP report requests a file name in an input text area. An other parameter that the user will provide is if the image is black and white bitmap image or a color bitmap image. This parameter is displayed using a radiobutton group in the selection screen. SELECTION-SCREEN: BEGIN OF BLOCK sel WITH FRAME TITLE text-000. PARAMETERS: bw RADIOBUTTON GROUP icol DEFAULT 'X'. PARAMETERS: color RADIOBUTTON GROUP icol. SELECTION-SCREEN: END OF BLOCK sel. Above provided ABAP source codes of the SAP selection screen generates the below screen for the user interface. This selection screen enables the user to enter the name of the bitmap image which is desired to export from SAP system. To get the stored images in SAP BDS (Business Document Service), ABAP developers can call function module SAPSCRIPT_GET_GRAPHIC_BDS. ABAP SAPSCRIPT_GET_GRAPHIC_BDS function module gets the binary data from SAP for a given specific bitmap image uploaded to BDS (SE78 tcode). The next step in our sample ABAP code is to call function module "SAPSCRIPT_CONVERT_BITMAP" to convert the returned binary data into bitmap file. ABAP function module SAPSCRIPT_CONVERT_BITMAP converts graphics in BDS file format into BMP bitmap image format. Here is how ABAP developers can use SAPSCRIPT_CONVERT_BITMAP function module. After BDS file in lv_content is converted to bitmap image and returned within graphic_table internal table variable, we are now ready to export bmp image to a predefined file folder. In order to export SAP BDS graphics file to a system folder, ABAP developers can use WS_DOWNLOAD function module. ABAP developers should set the filename parameter of the WS_DOWNLOAD ABAP function module in the format including the full file path. In this ABAP tutorial sample case, I used a constant file folder to store exported BDS images. Perhaps it is a better idea to use ABAP folder selector or Display File Dialog control using cl_gui_frontend_services=>FILE_SAVE_DIALOG method. But this is a topic of an other ABAP tutorial. 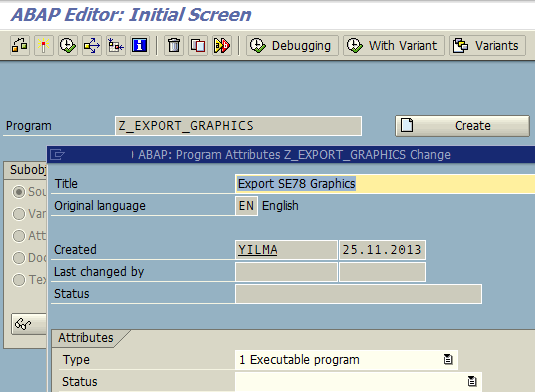 After recognizing the ABAP function modules that the developers can use in their ABAP programs to export SE78 images from Business Document Service (BDS), I can share the all source codes of the sample ABAP report Z_EXPORT_GRAPHICS created for this tutorial. CHECK pa_image IS NOT INITIAL. lv_content TYPE STANDARD TABLE OF bapiconten INITIAL SIZE 0. CONCATENATE 'u:\' pa_image '.bmp' INTO lv_export_file_name. After you activate your ABAP report, you can now export SAP logo from SAP BDS system. 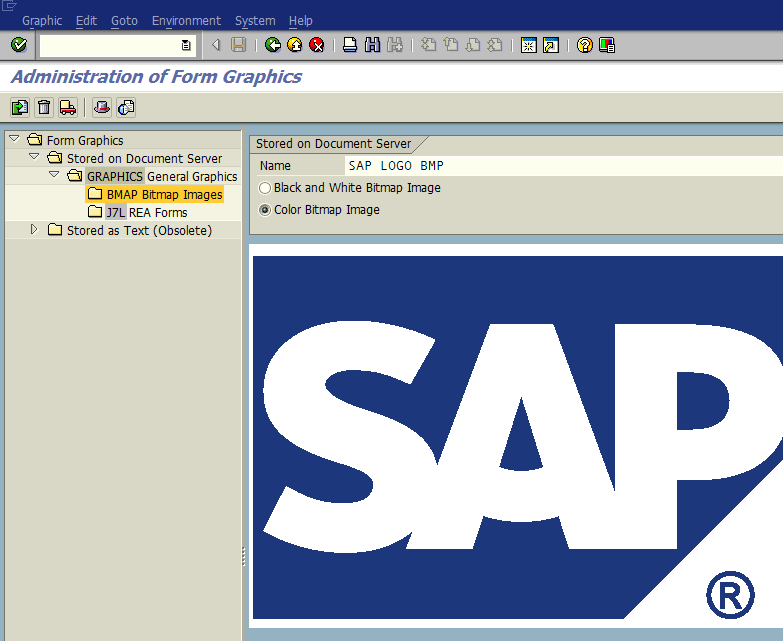 If you run the ABAP program z_export_graphics and enter "SAP LOGO BMP" as the name of the bitmap image and choose Color Bitmap Image option and execute the report, a graphics file will be created in the target folder with the same image name.